Hide this Project (Kolte Patil Jai Vijay) Discover properties in other projects by hiding the ones that doesn't interest you. You won't see them in your searches further but you can unhide anytime later. 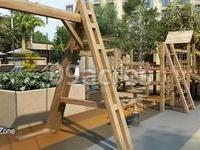 Kolte Patil Jai Vijay in Vile Parle (East), Mumbai South West by Kolte Patil Developers is a residential project. 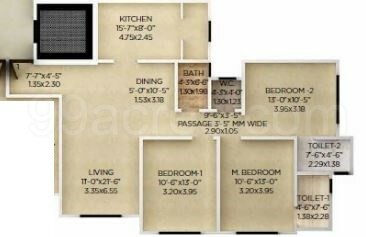 The size of the Apartment ranges in between 456.0 sq.ft. and 1218.0 sq.ft. Kolte Patil Jai Vijay offers facilities such as Gymnasium and Lift. This is a RERA registered project with registration number P51800004446. It is a ready to move and under construct project with possession in Dec, 2018 with few units already sold out. The project is spread over a total area of 2.22 acres of land. It has 44% of open space. Kolte Patil Jai Vijay has a total of 6 towers. The construction is of 11 floors. An accommodation of 258 units has been provided. Kolte Patil Jai Vijay brochure is also available for easy reference. What apartment sizes are available in Kolte Patil Jai Vijay? The project offers apartments sized between 456.0 sqft and 1218.0 sqft. What is size of 1 bhk in Kolte Patil Jai Vijay? The area of 1 BHK apartments is 456.0 sqft. 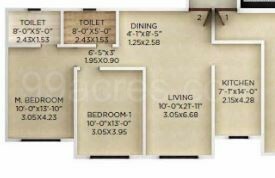 How much is area of 2bhk in Kolte Patil Jai Vijay? Two-room units (2BHK) in the project are available in an area of 650.0 sqft to 775.0 sqft. What is the 3 bedroom size in Kolte Patil Jai Vijay? 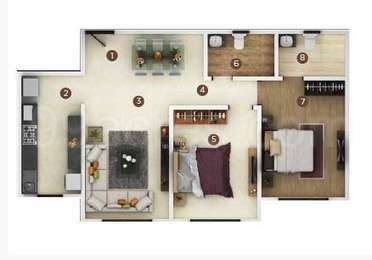 The area of 3BHK units in the project varies from 930.0 sqft to 1056.0 sqft. How much is area of 4bhk in Kolte Patil Jai Vijay? The area of 4BHK units in the project varies from 1210.0 sqft to 1218.0 sqft.